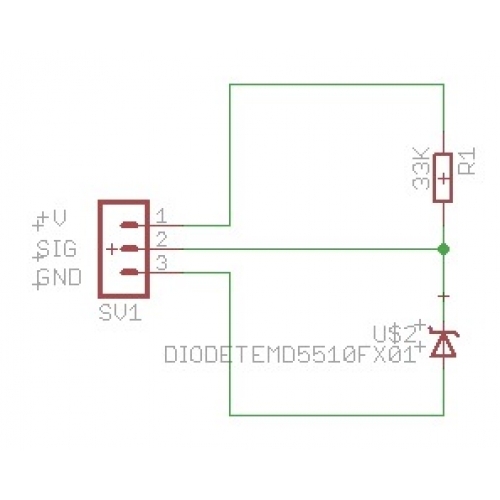 The TEMD5510FX01 ambient / visible light sensor is a PIN photodiode with high photo sensitivity in a miniature surface mount device (SMD). The detector chip has 7.5 mm2 sensitive area. It is sensitive to visible light much like the human eye and has peak sensitivity at 540 nm. 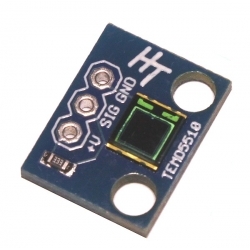 We have mounted this sensor on a small breakout board along with a 33k resistor. We specifically chose this sensor as a good companion to our Red Laser Module as it has a large sensor area. 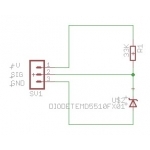 Supply Voltage (+V) should be between 3V and 5V, so is suitable for both 3.3V and 5V systems. 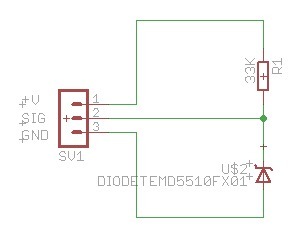 When connecting to a microcontroller input pin, use a suitably large resistor between SIG and the input pin (100K works well) to avoid effecting the sensor bias voltage.